Changing the number of weeks in a season really throws me off. I’m finding that I have to work to remember what week number we’re at, and thinking that usually at this week, we see x y and z, but the extra week is throwing me off. I would love to get back to staying with only 10 weeks, and enough celebrities for 10 great weeks and no double eliminations. And no stupid theme weeks, and crazy challenges. And go back to what made this show the amazing show that it is…. Make the next season RETRO-DWTS! No jazz, no contemporary, no charleston or bollywood or any of the other styles they’ve added. No lifts, no lifts, no lifts. No props, no huge productions allowed every single dance for every single episode. VERY limited use of the troupe, opening and bumpers. Pro dances choreographed by THE PROS! No themes. Lots of cha cha, jive, waltz and Viennese Waltz, tango and argentine tango, paso doble, foxtrot, quickstep, mambo, samba and whatever I’ve forgotten that we don’t see enough anymore. Oh, and bring back the No Score, Let’s Just Have a Blast Group Dance! Forget the need to have the professional dancers prove themselves by giving impossible challenges, let them prove themselves by letting them teach and dance they styles they know so well! Now, shall we talk about Hayes elimination? No, much has been said already. I will say, though, that he has grown and matured quite a bit while on the show, and Emma’s definitely taught him a LOT, and not just dancing, but Life. I know Tamar got a bad edit in her package, but what she said doesn’t bother me as much as what Val said, “I feel like she’s finally starting to trust me, and it’s week 7.” Ouch. It does show. She can’t develop a good connection with Val, becaue she just doesn’t trust him? herself? It’s more than what Louis said on AfterBuzz when he blasted Julianne for saying she doesn’t see a connection between them in hold, because you’re not supposed to be looking at each other…. Look at Hayes and Emma and the connection they’ve got, and compare it to the connection between Tamar and Val. To me, Tamar and Val just feels… Lifeless? Emotionless? Like she’s just putting in time, and going through the motions and not investing anything of HER other than what’s expected. Hayes trusts Emma, and he likes Emma, and it helped their dancing. It’s hard for me to completely put into words, but if Tamar and Val had the same level of trust and the same level of emotional connection (not passion), I would be very happy if she won this season. Moving on, Carrie Ann’s Parade blog is up and everyone should probably head over and read it. And to Carrie Ann? If you’re reading, HI! Don’t be a stranger, we don’t bite (too hard), please pop on and say hi! And I urge you to watch for Princess Heidi’s weekly Numbers post, she puts everything down in black and white and explains all of the numbers, and we can see why Hayes elimination wasn’t a huge surprise. It’s easy to understand, too. Julianne’s blog is up over on Instyle.com, and you can head over and read it by clicking the link. We get to read about Julianne’s GORGEOUS! updo!!! Did anyone else think that it was the perfect style for her wedding???? I couldn’t find any photos of Leah, but, she did much better than last week, and I loved seeing her frightened…. Love seeing the scares. I wouldn’t like it if it happened TO me, but Sasha’s such a sweet guy, how can anyone be mad at him long? Heads up! On Monday, Leah Remini will be taking Erin Andrews place as co-ost of Dancing With The Stars. Here is more from E Online. She will be funny. Love her! Feeling déjà vu?We are, too, because we also reported on Remini filling in for Andrews last October during the Series, too! To read the full article, see E Online. Dancing With The Stars Tony Dovolani interviewed Leah Remini on her new show “Leah Remini: It’s All Relative”. He tries to keep things serious, but, well, you know Leah. These scores led to the following vote requirements. Note that in week 9, the margin between Leah and Liz was less than 7k votes. 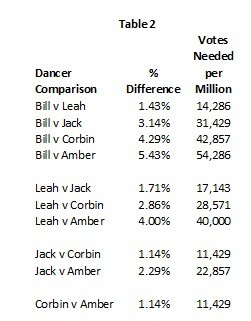 This week, when they aren’t over inflating everyone’s score trying to get rid of Bill, Leah needed well more than 17k votes per million votes cast to get to Jack, Amber or Corbin. Here’s what caused her to be eliminated – all of the following happened: Read more.. Thanks to Selindira for sending, below is a new interview with Inside Dance (Suri) and Tony Dovolani for those interested. Tony talks of his career in dancing, his dance studios, his dance partners on Dancing With The Stars (I love what he says on Wynonna), what it’s like behind the scenes (pay close attention to this part. He mentions how some have two personalities on and off camera but, he only has one. what? ), and the “haters” at the end and how he deals with them (what about when you “hate”, Tony?). Hey All! Be sure you see Kerli’s new blog at her official site when you get a moment. Below is a take about what she wrote about the show and her experience. There is also a really cool gallery at the link with some “behind the scene” takes of she and the cast. Too cool. I love her! Thanks to Elmari for sending us this news! ….There are hundreds of people working on the set and everyone is not only the best at what they do but a truly sweet human being. Love this team so much, especially the make up trailer ran by a flock of epic ladies. The dances, of course were amazing…it’s so cool to see people get on the show willing to win or make a fool out of themselves in front of 16 million people. It’s all about pushing your own limits after all…I also love that the celebrities are so diverse…how rad is it to watch Chaz Bono stand tall in the spotlight, inspiring every LGBT kid out there to not be ashamed of who they are. Kudos!! Access Hollywood has posted a new interview they did with Maks Chmerkovskiy this week (I think this took place last Monday before he judged the show?). He talks of how he’s not coming back as a dancer on Dancing With The Stars and why. He also talks of judging and who will win Dancing With The Stars Season 17 and lots more. ABC Releases Details For The Dancing With The Stars Finale!! ABC has issued details for the finale of Dancing With The Stars Season 17. As well as the freestyles, I can’t wait for the Samba Relay. The two nights are going to be jam packed. Below is more. “Episode 1711 & 1711A” — After 10 weeks of entertaining, stylized dancing from Corbin Bleu & Karina Smirnoff, Jack Osbourne & Cheryl Burke, Bill Engvall & Emma Slater and Amber Riley & Derek Hough, only one couple will be crowned “Dancing with the Stars” Champions. These four remaining couples will have one last opportunity to impress the judges and the viewers on MONDAY, NOVEMBER 25 (8:00-10:00 p.m., ET), concluding with the Season Finale, TUESDAY, NOVEMBER 26 (9:00-11:00 p.m., ET) on the ABC Television Network. On MONDAY, NOVEMBER 25 (8:00-10:00 p.m., ET), “Dancing with the Stars” season 16 Champion Kellie Pickler returns to open up the show with her country hit “Little Bit Gypsy,” accompanied by the pro dancers. The four remaining couples will then compete in three rounds of dance. 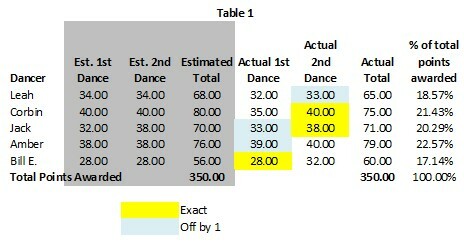 In the first round, each couple will take on the “Judges Pick” and repeat a selected routine from earlier in the season. In round two, the couples will be challenged to a Samba relay, where each pair dances to a different section of the same song. The Samba relay will be accompanied by 90’s hip hop group TLC who will perform their classic hit “No Scrubs.” In the last round, and one of the biggest competitive dances of the season, the couples take on a supersized freestyle featuring special effects, additional dancers and unexpected surprises. At the end of night, one couple will be eliminated based on the previous weeks’ viewer votes, combined with the judges’ scores from Monday night. In the two-hour Season Finale on TUESDAY, NOVEMBER 26 (9:00-11:00 p.m., ET) and in the the last element of competition, the couples will perform a new routine as part of a “24 Hour Fusion Challenge.” During Monday night’s show, the remaining couples will choose songs for their competitors that fuse two contrasting dance styles and they’ll all have less than 24 hours to prepare that dance for judges’ points the following night. The finale will feature performances by Lady Antebellum who will perform their new single “Compass,” and Enrique Iglesias will sing his current hit “Heart Attack.” The entire celebrity cast returns including: Elizabeth Berkley Lauren, Brant Daugherty, Keyshawn Johnson, Christina Milian, Bill Nye, Nicole “Snooki” Polizzi, Leah Remini and Valerie Harper who will dance with partner Tristan MacManus to a version of “What a Wonderful World” by singer Colbie Caillat. In addition, Ylvis will perform their hit single “The Fox,” accompanied by select celebrity and pro dancers. At the end of the night, the public vote from Monday night will be combined with the judges’ scores from both nights to crown the Season 17 Champion. Be sure to read more at ABC. Thanks to @DWTSgossip for the heads up!